Treat skin to some TLC with the Time Bomb ABC Serum ; a topical mega-dose that supplements skinâ€™s lost vitamins to improve the look of fine lines and wrinkles, promote elasticity and firmness, brighten tone and refine texture. 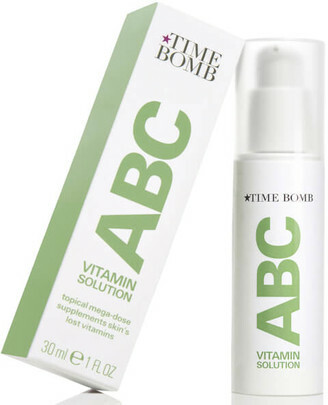 With skinâ€™s natural ability to absorb key vitamins diminishing with age, ABC Vitamin Solution delivers a direct infusion of vital nutrients to ensure your complexion remains smooth, tight and radiant. Enriched with a potent blend of Vitamins A, B and C (hence the name!) alongside powerful antioxidant Bakuchiol that mimics the effects of Retinol, the intensive anti-ageing solution facilitates healthy cell turnover, stimulates microcirculation for improved regeneration and improves the look of uneven skin tone. Powerful and reactive, the formula replenishes skinâ€™s moisture levels with hit of Hyaluronic Acid and Squalane to leave skin plumped and glowing.